Introduction: Typical chronic apical periodontitis is generally accompanied by periapical bone destruction, which is radiographically observed as periapical radiolucency around the apex. Pathological events in apical periodontitis are mainly characterized by bone destruction and this bone destruction is mediated by osteoclasts which are multinuclear cells derived from macrophages. Although bone tissue possesses the capacity for regeneration, there are many pathological situations in which this capacity is not sufficient to stimulate and realize healing processes. The development of biphasic calcium phosphate ceramic for bone graft is one of the promising biomaterials for better control of the complex processes of bone healing and regeneration. 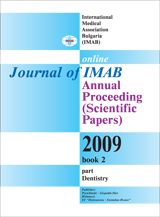 Following the ideology of the injectable implant material , this study used as, scaffold fine powder particles of biphase calcium phosphate ceramic mixed with saline solution. Results: The results of this study are presented in the radiographs listed as Fig. 5, 9, 10 preoperatively and Fig. 6, 7, 8, 11, 12, 13 and 14 postoperatively. The sequence of replacement of radiolucency with a radioopacity in periapex should be considered as one of the characteristics in remodeling of the processes after treatment. These findings showed that in a lapse of time the healing processes involve immature bone and fibrous connective tissues. Concluding remarks: The basic aim of this study is to achieve healing and probably bone regeneration in the clinical treatment of apical lesions, using methods of bone regeneration and tissue engineering. The positive results of the present pilot study demonstrate: bone remodeling, biomimetic obturation of the translucent apical zone and apical foramen. Key words: apical periodontitis, bone regeneration, apical obturation.